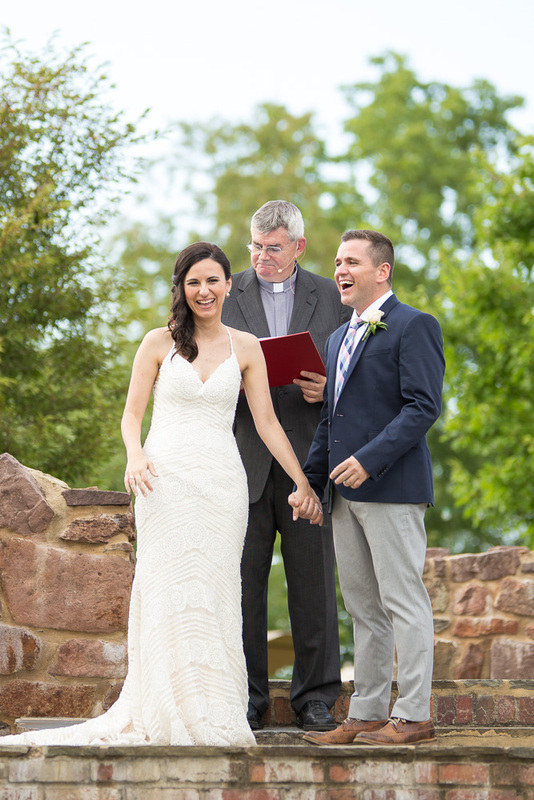 Angela and Dan tied the knot at the Winery at Bull Run on an absolutely beautiful summer day. 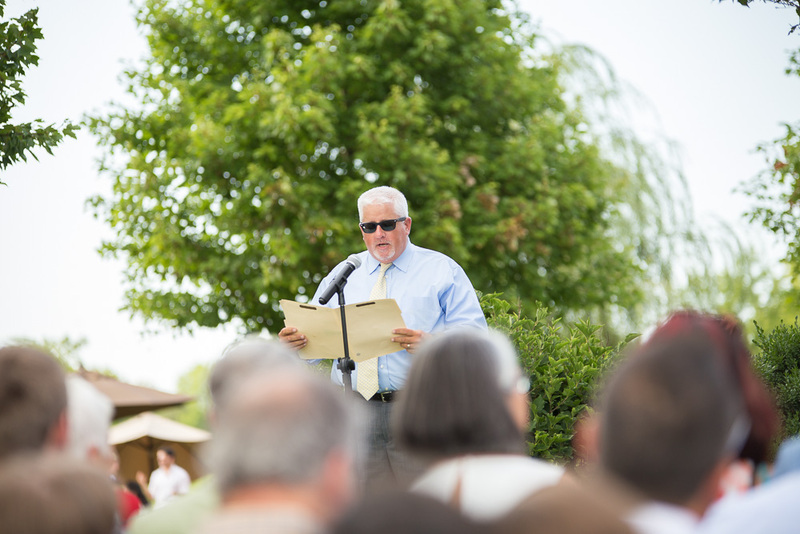 The sun was shining, the wine was flowing, and their closest family and friends were all there to enjoy it. Their blush, navy, and gray color palette was so perfect, and I loved the mixed bridal party - they had both groomsladies and a bridesman! The only thing missing was their adorable pup Jax, but you can check out their engagement session if you need some of his puppy cuteness. Angela and Dan got ready at the Hyatt Place hotel, and the rooms were right across the hall from one another! Everyone had to be careful opening the doors so no one accidentally saw each other before they were supposed to. Angela and Dan exchanged letters while they were getting ready. I've always loved this sweet idea. Can you read that? Jax left a note too! 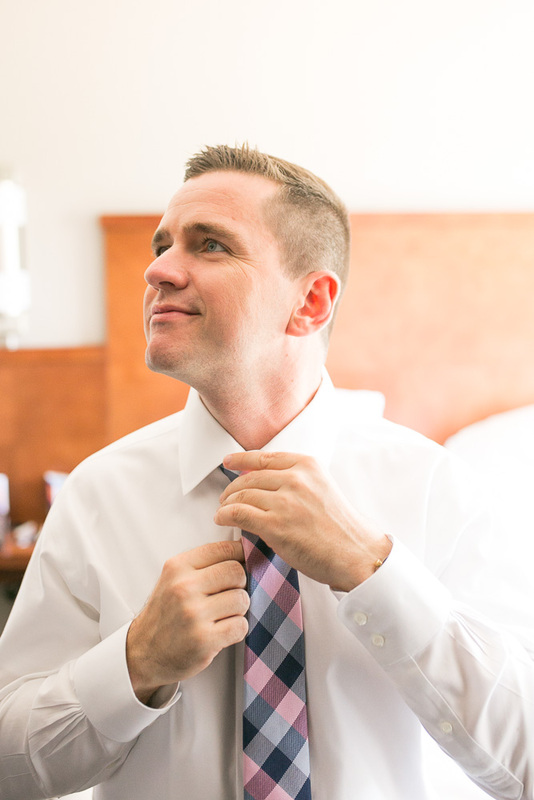 After putting on his own tie, Dan graciously (and gracefully) helped the groomsmen out with theirs. He looks super elegant here demonstrating the lesser known "eye poke knot." 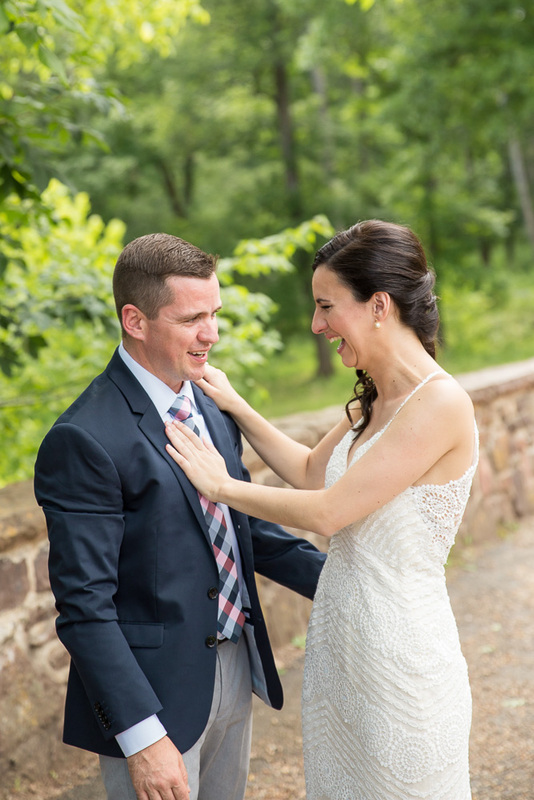 Manassas National Battlefield Park is right next to the Winery at Bull Run, so it was the perfect place to do Angela and Dan's First Look. Dan and I got to the Stone Bridge first, and waited for a text from Angela that she had arrived! I think these are my favorite photos from the whole day. The happiness when they first see each other is the best! Dan's checking out the intricate detail on the back of her dress. Yep, that's totally what he's checking out here. The Stone Bridge is a pretty popular spot in the park, but we got very lucky and had it mostly to ourselves! This seriously looks like a Pinterest inspiration board. 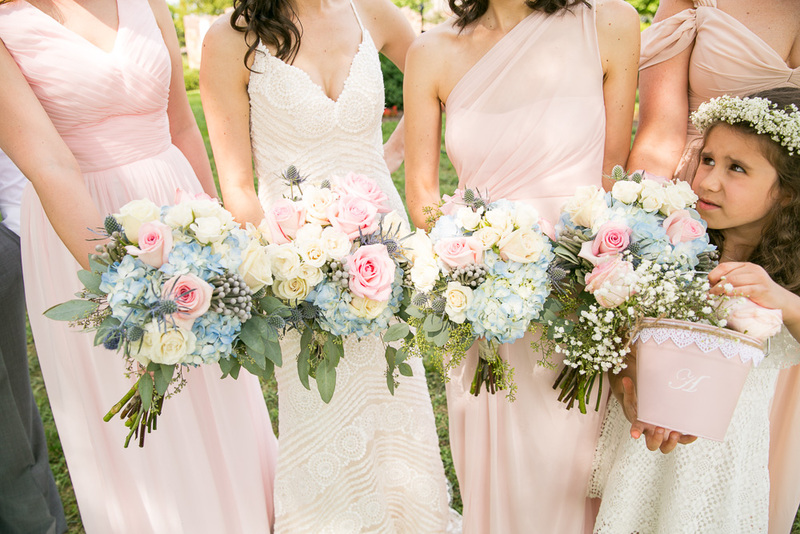 Love how the blush and navy go together! Of course we had to grab bridal party shots in front of the Winery at Bull Run's iconic mural. And the colors of it went perfectly with the wedding colors! The ring bearers are my favorite part of the next few photos. I love this idea of having lemonade and water out for the guests when they arrive. So perfect for a summer wedding. People always wonder if doing a First Look ruins the aisle moment. Nope! That emotion is still there! I am so in love with this ceremony site. The Hillwood Ruins are such a unique spot! Angela is Canadian, so when Uncle Mike dropped an "eh?" into his wedding reading, it definitely got some laughs! She's Portuguese too, so I don't know why no one threw in a Portuguese soccer reference (like my husband did in our wedding ceremony). Missed opportunity Tio Mike! Dan's so happy that he gets to wear a ring now too! Slipping away after dinner to grab sunset photos is always a good idea! All of the toasts were so heartfelt, and there was a good mix of laughter and tears!